Used for: Root CA certificates placed here are automatically trusted by all domain members. An AD-integrated CA places their certificate here during installation. You can import other Root CA certificates here manually. Used for: Contains CA certificates from CAs that can issue certificates in the AD. Used for: Contains the certificates for any key recovery agents. Key recovery agents must be manually configured on the CA. Used for: Contains CA certificates from CAs whos smart card and domain controller certificates are trusted for Windows logon. AD-integrated CAs are added here automatically duing installation. Note! This object is created by the first AD-integrated CA, but subsequent CAs modifies this object instead of creating new uniqe objects. More information on this later in this article. 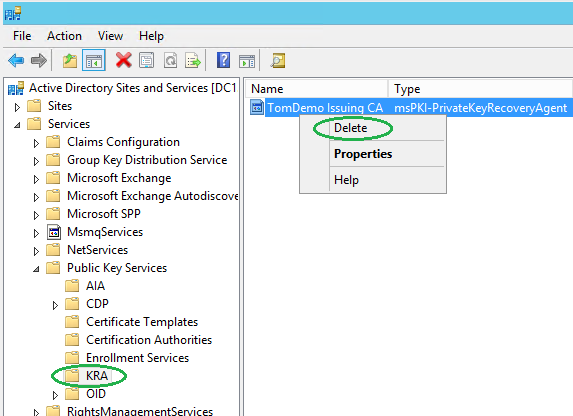 When you later uninstall the CA role from the server only one AD object is actually removed, the pKIEnrollmentService object. When that object is removed clients will no longer try to enroll certificates from that CA. The other PKI-related objects are left intact, because any issued non-revoked certificates will have problems if they do not exist. If you are sure that all issued certificated from that CA server are either expired or revoked you can/should remove these CA-related objects from AD. Important note: Make sure that you do not delete any objects related to other PKI installations than the CA you are about to clean up! Note! 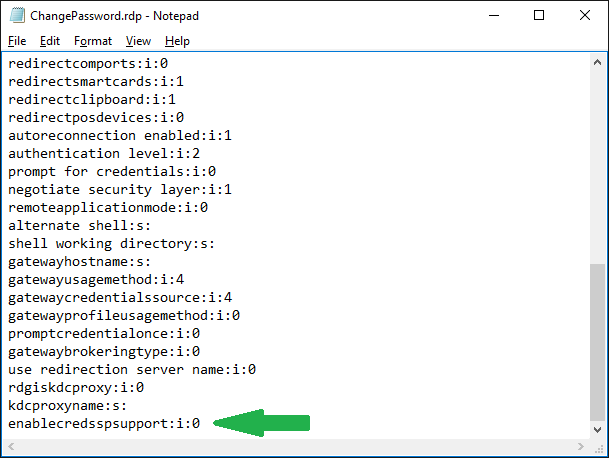 You can also do some of these steps with Manage AD Containers in the Enterprise PKI snap-in , but there are some issues there (KRA entrys aren’t shown), so I’d stick to Active Directory Sites and Services. Now we have to delete the CA-server from the NtAuthCertificates object. This is however a bit different, since this is not a separate object, but rather a value in an existing AD object. Change the highlighted Forest Root information according to your environment first. Make sure you have selected the correct CA certificate (the screenshot only shows one certificate, you might see one or more) and then click OK. Choosing Cancel aborts any deletion attempts. 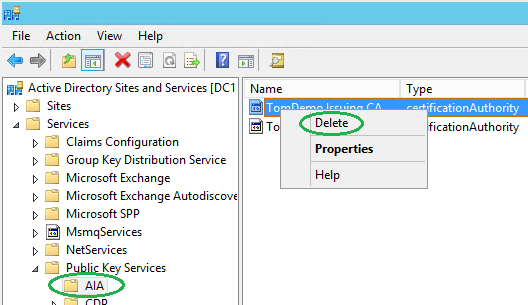 There you go, all information about the CA has been removed from the Active Directory. You are now ready to implement a new, fresh PKI-solution! This entry was posted in CA, Certificates, PKI and tagged Clean AD, metadata cleanup. Bookmark the permalink. THANK YOU!!! Had to rebuild my PKI deployment and was beating my head against the wall trying to figure out where the old certs were coming from. We have only one CA ( Ent. Root CA) issuing all certs.I have setup a new Ent. subordinate CA , and when I requested computer cert from a member server , the request was going to Sub CA instead of Root CA.. When i disable computer template on the subordinate CA , and submit new request from member server , the request is failing saying template is not published on sub CA …BUT the template is published on Root CA. 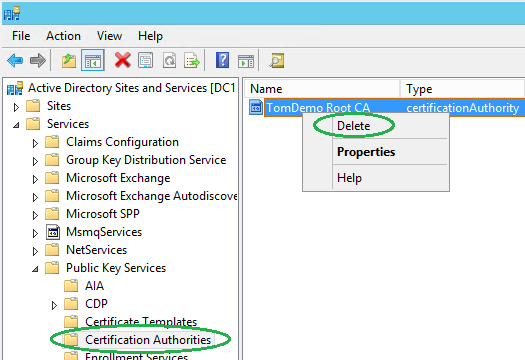 How do we tell domain member servers to request cert from Root CA , when template is not available on Sub CA. Is the above behavior expected ? Any suggestions ? It is VERY unusual to have both a Root CA and an Issuing CA online and both giving out leaf certificates. Any reason for doing it this way? The most common PKI setup is to have one offline Root CA that ONLY signs SubCA certificate requests from one or more online Issuing CAs. There are of course even more complex PKI setups as well. That being said, when a client wants to autoenroll it looks in AD to see which templates they have permission to autoenroll from. Then they look in the “Enrollment Services” container in AD to see which CAs actually publish those templates. If more than one CA publish the same template they chose only one of the CAs, they never enroll a certifikate from a template they already have a valid certifivate from. So the fact that the computer cert was coming from the SubCA was probably random, it could also have come from the RootCA. If you manually enroll a certificate via MMC you should be able to choose which of the CA-servers (that are publishing the template in question) you want to enroll from. Did you delete the old computer certificate, revoke it on the CA or try to re-enroll from the existing certificate? 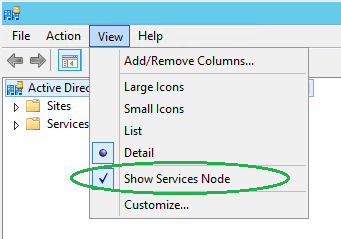 I have had an issue with an 2012 server that has a domain migrated from a previous sbs 2011 server. They never uninstalled the CA role before they decommissioned the sbs and drpromo’d to remove from AD. Now the 2012 server and clients are looking for a long gone DC to renew Certs and causing Errors for CertificateServiceClient-AutoEnrollment Event ID 6 and 13. The old DC is long gone years ago, so can these steps be used to safely remove all the references to the CERT that should have been reomoved properly? If so will it affect AD or the clients in anyway? I have a few windows 10 pcs that no say Certificate expired when they start up. Yes, these steps could be used to remove any remains of a no-longer-existing CA server, regardless of if it was installed on a DC, SBS or a dedicated server. Be sure NOT to remove any object related to a any new CA servers though. The affect it will have on the clients/servers is that they will no longer find references to that server during auto enrollment process and will therefor no longer try (and fail). Expired certs is natural, since you have not renewed or issued them for a long time. But do they say it with some sort of dialog, or is it just in the event log? Thanks for this – I replaced an old SBS server with a plain old DC and Exchange setup – but that SBS had been an unused CA, and although I removed that before demoting and removing it, the other DCs were creating warnings constantly trying to re-register their certs. Great article. Helped me a lot in getting rid of those old certificates in the enterprise ca certificate store. 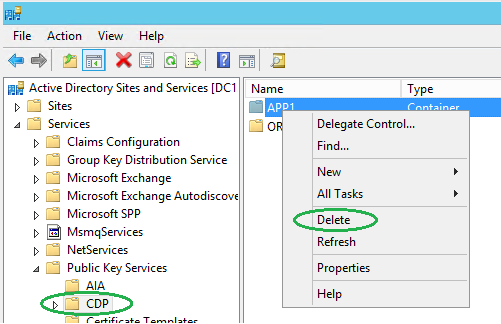 We had an SBS server that was removed (and correctly according to MS intructions), and replaced with 2008 R2 DC and separate Exchange, the only certificate on the new DC is the old SBS certificate, is it ok to remove this and have no AIS PKS on the DC? It’s hard to be sure without more information. What type of certificate is present on the new DC? My advice would be to make a backup of the certificate (including the private key), just in case, and then delete it. IF issues occur, just reimport it again. What do you mean by AIS PKS? The OID container contains many default OIDs, such as Server Authentication, Client Authentication etc. Sure, you should be able to delete them and recreate the default ones with the command certutil -installdefaulttemplates, but I have never done this. The Enterprise CA certificate is added to the NtAuthCertificates container in AD during CA install. 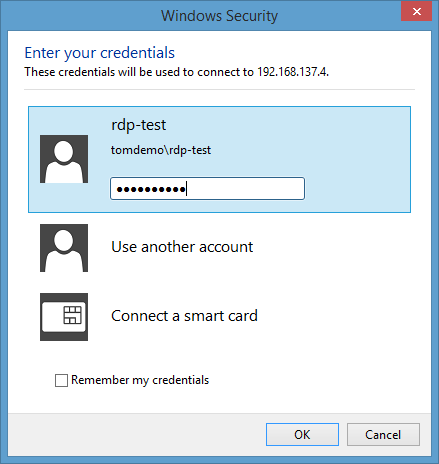 Domain Controllers then look in that AD container during smart card logon verification. But that certificate is not propagated to the NtAuthCertificates container locally on clients/servers. That certificate will however be propagated to the Intermediate Certification Authorities container on clients. To view/edit the NtAuthCertificates container in AD, start pkiview.msc, right-click Enterprise PKI, choose Manage AD Containers and select the tab NTAuthCertificates. I followed the procedure outlined in this article. We too had a CA that had long since been decommissioned. All of the issued Certs (Root, Intermediate and machine) are expired. I have not yet installed a new CA. I notice in AD Sites and services that there are 31 objects in the Certificate Templates folder in AD Sites and Services. Is it OK to delete the objects? There is also an object called “NTAuthCertificates” in the root of the Public Key Services folder. Can this object be deleted? Lastly, am I free to delete all existing Computer, Intermediate and Root Certs that were issued by the old decommissioned CA? I generally do NOT delete objects in the Certificate Templates container. I rather install a new Issuing CA (without loading the default templates), and only publish the Certificate Templates that I know I want to use. Remeber that certificate templates are not stored by CA servers but rather by AD, and each Issuing CA then choose which of them they publish. There is no way to use a certificate template that no Issuing CA is publishing. By technically you can delete them. A new CA installation will re-add them, or you can add them manually by running “certutil -installdefaulttemplates”. If you are absolutley sure that there are no more certificates stored in the object called NTAuthCertificates, you could delete it, but if you do not see any certificates by running pkiview.msc, right-clicking Enterprise PKI, choosing Manage AD Containers and select the tab NTAuthCertificates, there is no need to delete the object. Since the old Root CA certificate has expired, all issuing and leaf certificate will also have expired. So yes, you can delete anything that chains to that expired Root CA. I really want to thank you for your prompt reply! I have now installed a non-domain joined Root CA and created Root CRL and Cert for my domain. 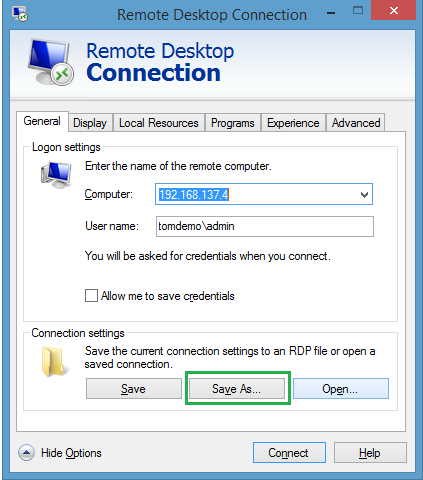 (This Root CA will then be shut down) I will then install a domain joined Sub-Ca, copy the Root Cer and CRL to it, and publish the Root CRL and AIA to Active directory. When the new Sub-CA starts publishing, will it simply overwrite the old certs in my AD? You do not actually need to copy the Root CA cert and CRL files to the Issuing CA server, any domain joined computer will work (including the Issuing CA). When the Sub-CA is installed it will publish its own certificate and CRL to AD (you need to copy the files to any HTTP locations you configure, this is not automatic). No certificates in AD will be overwritten, it will only add its own. We have one Ent. 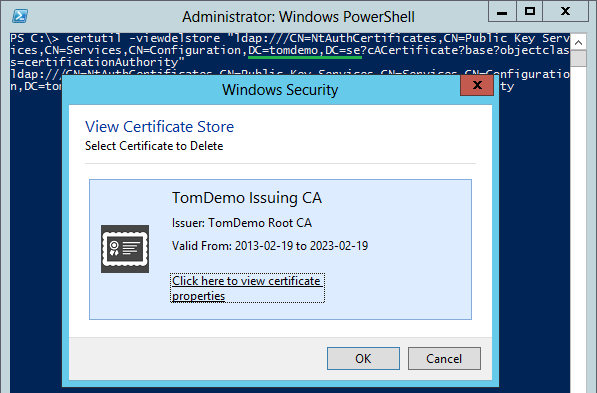 Root CA issuing all certs. I have setup a new Ent. subordinate CA , and when I requested computer/user cert from another server or Domain controller itself , the request is going to Root CA instead of Sub CA. Note that this does not delete the template itself, it only deletes the publication of it on that CA. Unpublish is a better word. Don’t forget to publish them on the new CA. You guys are the Angels of the IT world; sharing such a valuable knowledge with such details. We say God bless u when someone do something as nice as u have; so God Bless you. Thanks a Million. Greetings, I’m glad I stumbled across this article in my scouring of the interwebs! I have the standard 1 offline root CA and two online subCA setup. I need to decommission one of the subCAs since that location is closing. All of the certs issued on custom templates will be decommissioned as well, so I’m not worried about those, but I have workstations with certs issued on the server I need to retire on the Computer (Machine) Template that is fed via domain. I’d like to know, what is the impact to these workstations when I uninstall Certificate Services from the subCA? Is there a graceful way to push them to re-request a domain cert from the remaining subCA? 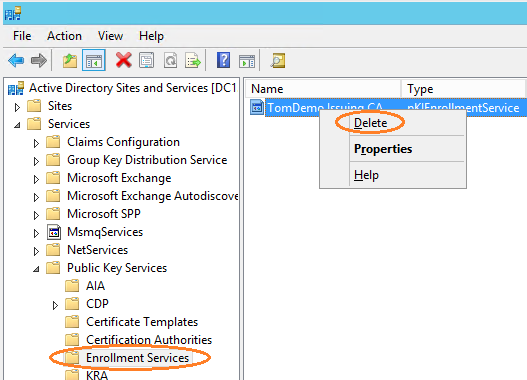 Can I remove the retiring subCA cert entry from ADS&S > Services > Public Key Services > Enrollment Services to force the workstations to re-request? If you remove a CA that has issued certificates that are still valid, it can no longer issue fresh CRLs for these, and they will soon become untrusted (at least on platforms where CRL checks are performed). The first step is to make sure that the Template is published on the CA server that will remain. 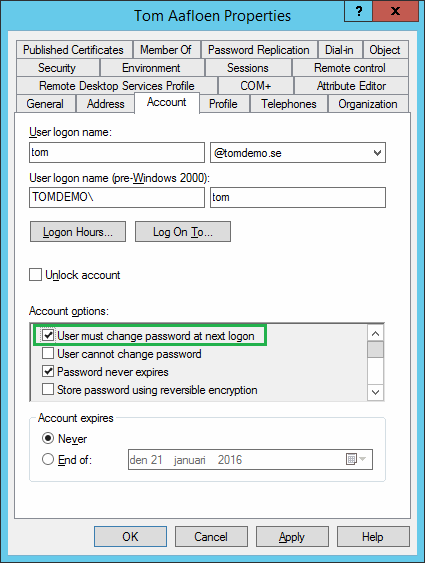 Then you could choose to “Reenroll all certificate holders” for that Template. This means that anyone that has a certificate based on this template will re-enroll for a new one at the next check-in. But this also means that those who enrolled from this template on the remaining CA will renew as well. And some computers might not be on-prem to enroll, but still needs the current certificate to be valid. To manage this you can issue a CRL on the CA that will be removed, with a validity that is longer than any issued certificates from it. This way the certificates from the old CA will be valid until they expire (but you won’t be unable to revoke any certificates). Make sure that the CRL is still available at the old CDP (might need to reconfigure DNS, depending on where you store it today). Alos, be sure to backup the old CA (including keys) before you remove it, you never know if you might need to restore it for some reason. we have installed a new PKI in our AD domain. I think we have replaced all relevant certificates off the old PKI with those from the new PKI. Since there are thousands off old certificates and not only Microsoft-devices I want to be sure what will happen, when I remove the old CA i.e. if I forgot any device. Is there a possibility to simulate the removal of the old PKI? They asked if it was ok to delete the orphaned DC and if it would not have any impact on any certificates that it had issued? My first thought is no, but I can’t seem to find anything to validate this. Does anyone have any thoughts or know the definite answer? how to remove one certificate in the domain? I need more information to be able to help. I do not understand “Remove one certificate from domain”. What certificate (CA, RAS? ), and from where exactly? If you mean invalidating one domain issue cert, you need to that from your issuing ca, then issue a new cert if one is needed. If its removing an old issuing CA cert for your domain, I suggest you follow tom’s article above. Good luck. Thanks sooo much for this article. Who knew along with the sites and services you had to also remove the certs from the cert store in AD. I cleaned up using the Sites and services but kept on seeing two trusted cert server certificates in each pc I joined to the domain I couldn’t figure out why, now I know….thanks so much the article was great! THANK YOU!!! VERY MUCH APPRECIATED! !